The 13th Annual Pinot Noir Summit was held at the Atlantis Casino Resort Spa in Reno, Nevada on July 24th for Wine Trade and July 25th for Wine Lovers. After 12 successful years in San Francisco, it was a gamble and a lot of work to take this event to a new location. It was a gamble that paid off BIG TIME! If you can’t wait to view the scores and medals and just have to see them NOW, go ahead. You can read the rest of the blog later. The team at the Atlantis were absolutely amazing! I have done events all over the world and have never met a more professional or more willing group of people, even when I asked a pretty difficult change at the last minute, the response was we can and will do this. If you are looking for a Five Star Experience for holding an event or just a fabulous place to stay, you absolutely won’t find a better place than the Atlantis Casino. Buy your tickets early, we sell out every year. 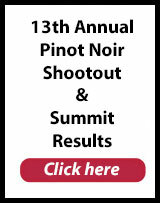 The 13th Annual Pinot Noir Shootout was the most exciting Shootout ever because the competition was so fierce. So many amazing wines were submitted…our judging panel tasted 497 Pinots. WOW! A daunting task in itself, but we taste only 32 wines be day and we taste each wine twice before we determine which wines will move to our finals. The wines the judges tasted that delighted and fascinated them will be noted here. Every year we find outstanding examples of Pinot Noir from wineries that we know and we’re always pleasantly surprised by wines submitted from producers new to us. 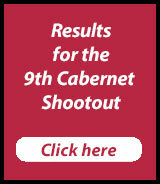 The Pinot Noir Shootout is the only wine competition in which the judges’ conclusions are put to the test by a large unbiased group of wine lovers. 46 of the top-rated wines were featured at The 13th Annual Pinot Noir Summit for wine lovers on July 25th at the Atlantis Casino. At the Summit, over 225 adventurous Pinot Noir lovers, seeking true splendor in the glass, experienced and evaluated the 46 luscious Pinot Noirs in a blind tasting. The 46 wines represented some of the best wines from this year’s Pinot Noir Shootout. An additional 250 people joined the festivities for the Grand Tasting & Awards Gala on Saturday evening. 100+ Wine Industry folks joined us on Friday for the Special Trade Session, blind tasting wines, attending a seminar, and tasting wines with winemakers and winery owners. In a distinctly different format and atmosphere from other wine-tasting events, the attendees blind tasted the wines and pitted their palates against the expert judging panel. The wines were divided into 2 groups of 23 wines each (the Black Group and the Silver Group). The wines were dressed in Vino Sleeves and identified by a random color. The male and female votes were tallied separately. The Pinot Noir lovers spoke out loud and clear at the 13th Annual Pinot Noir Summit. In an unmistakable statement of preference, they embraced wines of elegance and varietal authenticity rather than burly Syrah-like Pinots, the muscular Pinot Noirs made popular by a few influential reviewers and their publications. 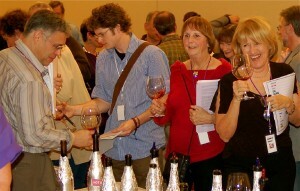 The Pinot Noir delegates agreed with the panel…the wines tasted were fantastic! The Pinot Noir Summit delegates however, did not rank the wines in the same order. Here are the winners as announced by Master of Ceremonies ~ Dave Preston, Nevada’s Guru of the Good Life at the Grand Tasting & Awards Gala. The wines worthy of note are reviewed here. Each wine is awarded a numerical score by the male and female panels. The wines are awarded medals as indicated. Previous post: What Do Footie Pajamas Have to Do with Pinot Noir?